All transactions are safe and secure with a reliable history in online purchasing behind each of our associates. 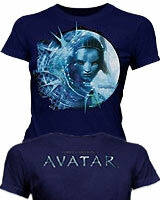 Buy the Avatar Neytiri t-shirt to own Avatar clothing and merchandise. While Jake Sully goes to Pandora to fight for a precious mineral, he ends up finding something even more valuable. After being rescued from some vicious Viperwolves by the Na'vi princess Neytiri, he is soon reminded of what is truly important. Although the circumstances are far from ideal, love soon blossoms between the two enemies. Remind yourself of the important things in life by getting this Navi Neytiri t-shirt, or act out the battles yourself with a Jake Sully costume or Avatar action figures. In addition to the Avatar Neytiri tee above, browse the Avatar Clothing Gallery for more apparel like men's and women's clothes, kids shirts or hoodies.